Martinus’ goal is to study at the Academy of Maritime Nusantara (AMN). 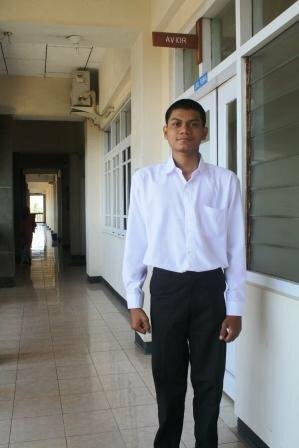 He is looking to work in a large port in Indonesia, and he wishes to be a student at AMN. He is taking the program in management and harbor administration. He comes from the city of Jakarta, in the Kalideres area. His parents are very old, and now they do not work anymore. During school, he was assisted with the costs by his brother, Martin, who has been working and has a family. Martinus feel sad and worried because so far, he has been troublesome to his brother. While he wants to continue his studies in AMN, Martinus enrolled to participate in the Kiva Student Loan program. Martin hopes to get a loan from Kiva through the Student Loan program so that he can continue his studies. He is very grateful to Kiva investors who assist him in order to achieve his dream. Congratulations to Martinus in Indonesia)..!